First we want to say a big thank you for the feedback and support we received since our first post! One of the things that caught your interest was our approach to offer an end-to-end encrypted connection to an Ethereum Node. We developed the Server in a way that involves both easy deployment of a Full Node via Docker as well as security out of the box by end-to-end encrypting the connection between server and app. After publishing our first story people asked us: “That’s all great but what if I want to use my existing infrastructure, can I connect your app to it?” Considering this we extracted the security layer we had put on top of the Node into a separate component. 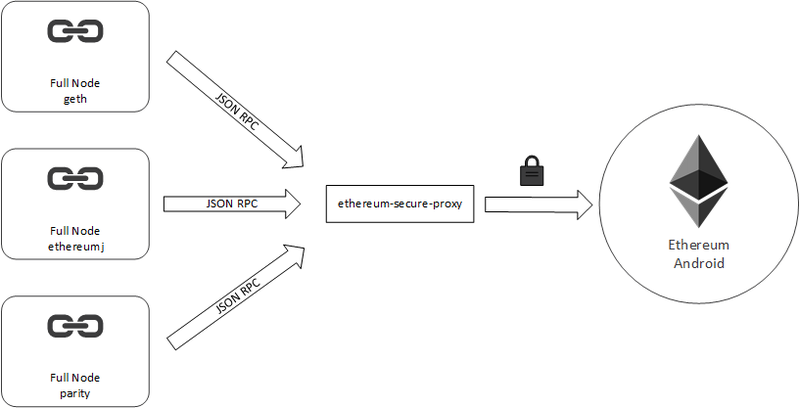 This component acts now as a thin proxy which makes it possible to connect any Full Node implementation (geth, parity, ethereumj, etc..) with our app as long as it exposes the JSON RPC. The proxy then connects to Ethereum Android end-to-end encrypted. Try it out for yourself, we are happy for your feedback!